Most productivity software is a variation on one of several similar themes: Apple’s Reminders for simple stuff, OmniFocus for complex task management, and Things somewhere in between. Momenta’s Agenda, a nifty app available for the Mac (and soon iOS), approaches the problem quite differently. Agenda is a 27.1 MB download and requires macOS 10.12 Sierra or later. Start with Momenta’s innovative business model, which merits explanation. Agenda is free to download, but it has premium features clearly marked in the menus and interface. You can use the app without them, but you’ll probably want to turn them on quickly. 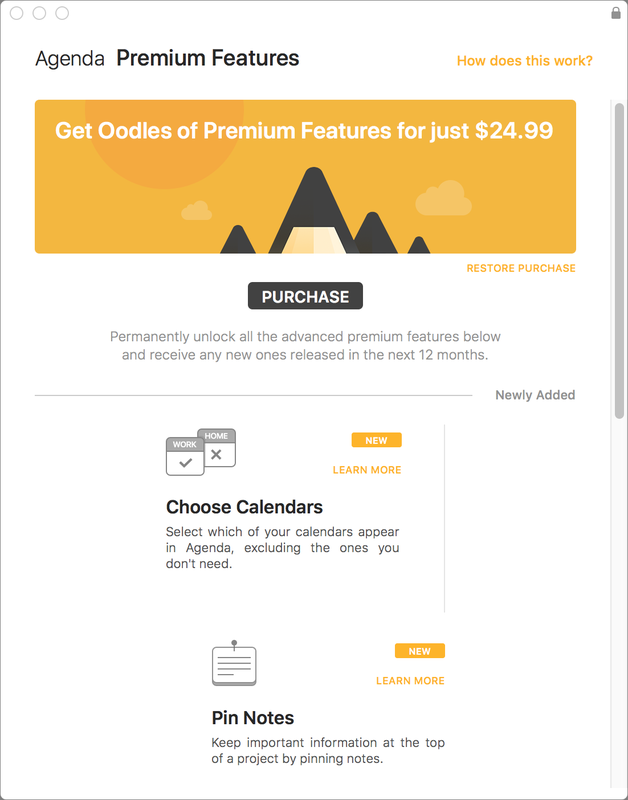 A $24.99 in-app purchase buys you access to all existing premium features and any new ones added in the next twelve months. Those features are yours forever. However, Momenta plans to keep adding features, and if you want the new ones after the year is up, you’ll need to pay again. It’s an interesting model, combining assurances to users that they’ll have permanent usage of what they already have, while also providing Momenta with a steady income so long as they improve the software. Agenda is organized around “notes,” a collection of which make up a “project,” and projects can be collected into “categories.” Notes can contain any number of freeform paragraphs, checklists, and bullet points. If you’ve used Trello, it’s a similar concept without the card/list/board metaphor (see “Trello Offers Compelling Collaboration Tool,” 9 July 2012). The Agenda window is simple and useful. The left sidebar contains a list of projects, grouped into categories. You can add both projects and categories with the + button at the bottom. The right sidebar shows your calendar, followed by notes you’ve worked with recently. The notes in the currently selected project appear in the main column in the middle, and clicking a little control at the top of each note lets you collapse and expand notes to simplify working on projects with many of them. 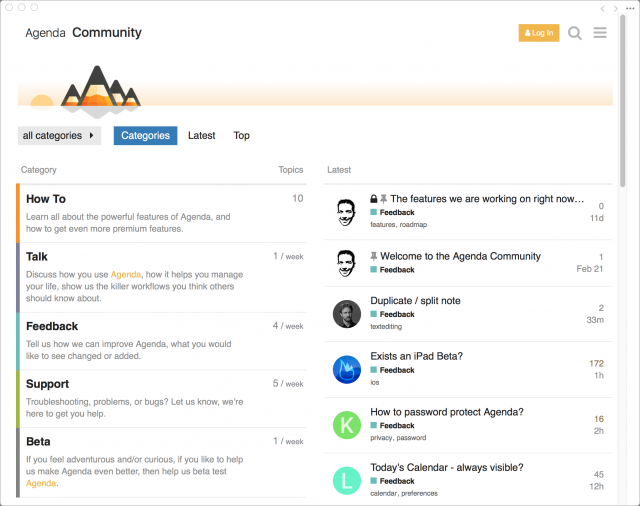 Agenda defaults to ordering notes in reverse chronological order, like your email inbox. Agenda lends itself to a narrative organizational style: a long list of self-documentation in chronological order. With Agenda, all of your notes are in one place, and you don’t need to go hunting for individual files where you might otherwise keep such notes. When notes have links to each other, or tags in common (which you create by typing #tagname anywhere in a note or selecting from a formatting popover), those other notes also appear in the Related Notes section in the right sidebar. Tags (like the orange “yak” in the screenshot above) are easily seen thanks to their colored backgrounds, which you can change if you want a particular color to mean something. Agenda also has a separate tagging system for people who are associated with a note or project: type Command-Shift-P, type a name, and it gets its own type of tag—note the blue “Christian” tag above. See the hollow orange dots preceding some of the notes in the screenshot above? When filled in by being clicked, such dots cause the note to appear in On the Agenda in the Overview category at the top of the left sidebar. Likewise, Today automatically groups anything you’ve added today or set as Due with another custom tag format. You can search for text in any note, or search for notes containing a tag or person. If you find yourself searching for the same tag or person repeatedly, you can save that tag search in the Overview category of the sidebar, for single-click access. Disconcertingly, when you click the X button to cancel a search, Agenda scrolls the main column to some other point. Within a note, clicking the circle to the left of a line brings up a popover that lets you format it, either indenting it into a subheading or making it into a list item. You can also use keyboard commands while you’re typing the paragraph, or open a gear menu for even more options. 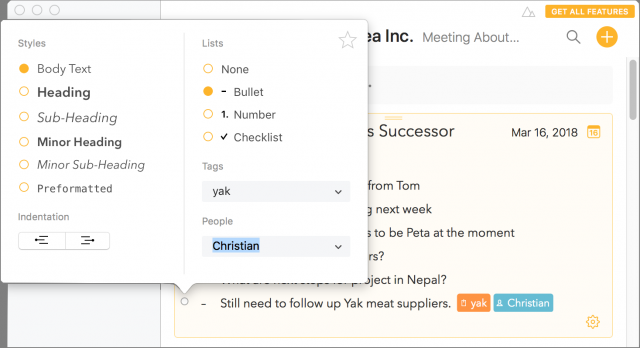 You could turn a list into a collection of tasks and subtasks, for instance, or an organizational grouping for meeting notes. 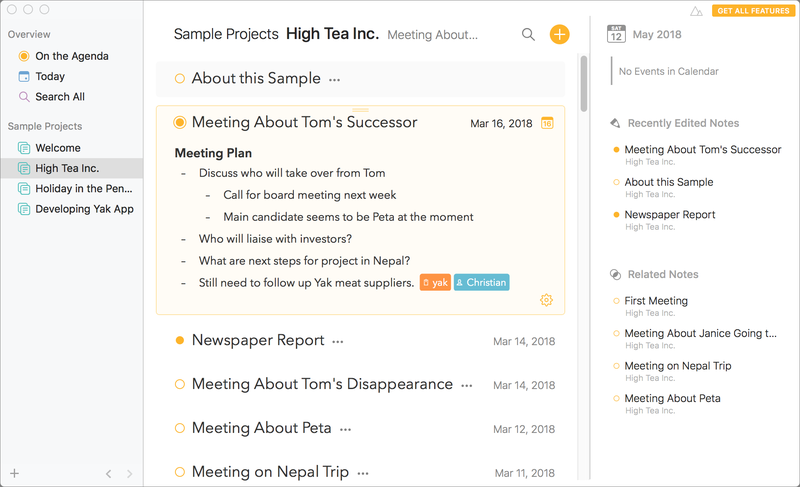 Everything in Agenda is aggressively linkable—you can link one note to another, one paragraph to another with tags, or to items outside the software such as calendar events. To link to Web sites in your notes, either paste in the URL or style text with a URL. You can also use Agenda’s Share menu to share these links (or the plain text of a note, or a Markdown version) with various services, including email, Messages, Notes, Reminders, and any other app that provides a Share menu extension in System Preferences > Extensions. Linking a note to a meeting event in Agenda creates both a link in the note and a link in the Calendar event. (Agenda achieves this linking via a custom URL scheme that the Mac understands, so the note field for the event then starts with agenda://note/many hexadecimal characters.) Clicking the event link in Agenda takes you to Calendar; clicking the link in the Calendar note sends you back to Agenda. There are many ways to get this kind of linking wrong, such as overwriting the event’s original note, and Agenda avoids most of them. But we did see notes linked to events losing their chronological ordering, ending up in places disconnected from either the note’s or the event’s time. Agenda integrates with iCloud for syncing data, but for now, you can only use it to see your data on multiple Macs. The developers are working on an iOS version that Momenta has promised will go into testing in May and is planned for a release before the end of June. 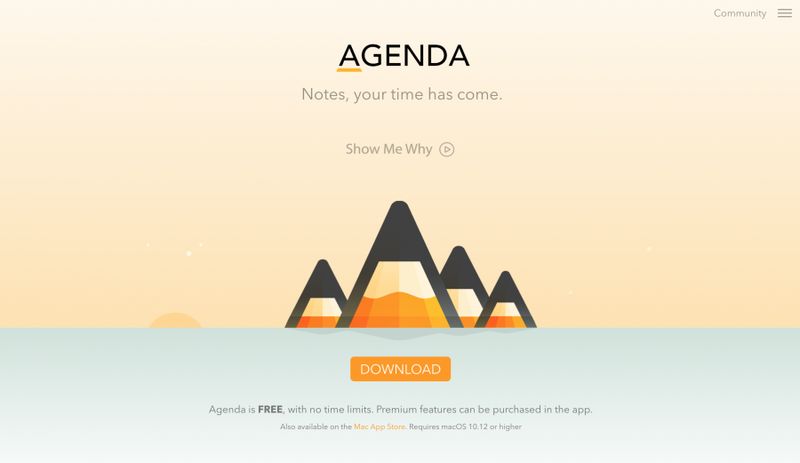 For many people, Agenda will be a non-starter until that iOS version ships, but Momenta is fully aware of its importance. Agenda provides a few ways to export your data, including PDF, Rich Text, and Markdown, but otherwise, it’s a silo. You can export individual notes easily, but you’ll lose the structuring Agenda provides. (Based on poking around in iCloud Drive, putting Agenda in iCloud doesn’t create any user-available files.) Similarly, Agenda can import data from Apple’s Notes app, but you can’t get data back out in that format. That’s all the good stuff, but Agenda is a young app and suffers from some bugs and nagging limitations. Two bugs gave the impression of data loss: in one case, once a particular note was collapsed, none of the expand commands ever worked on it again. Restarting the app didn’t help, but eventually, the note re-expanded on its own. In another, a note appeared blank and all its text was gone. That turned out to be just a display issue, and quitting and relaunching the app brought it all back. Tags don’t work the way they do in a Finder Get Info window, where each one acts as a single character when editing. Typing next to or in a tag sometimes causes odd behavior. If you type tags out in the middle of a line (perhaps to say that a particular person is assigned the task you just wrote), there’s no auto-complete, so you must type the tags perfectly every time. Tags can’t contain spaces, so people are first name only, or need names like Jeff_Porten and Adam_Engst. You can link calendar events to one note, but not to multiple notes. As a workaround, the note you link to can relate to any number of other notes. 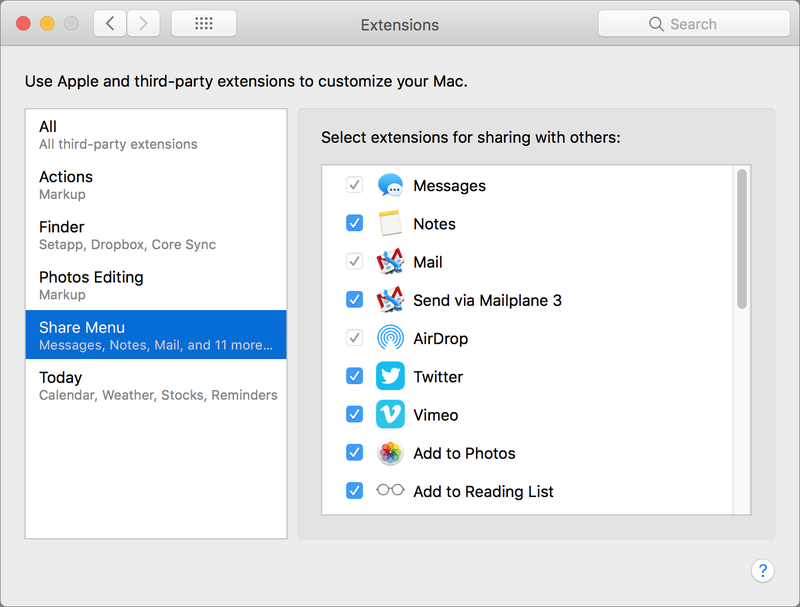 You can’t open more than one window, which limits options for those who rely on multiple desktops in Mission Control. Agenda comes with decent help, but it’s actually all topics in an integrated Discourse forum, the same discussion software that powers TidBITS’s article comments and TidBITS Talk. When you run the app for the first time, you’re encouraged to set up an Agenda community account. Opening a page from the Help menu reveals it to be a discussion thread, with running user comments and developer replies. The community itself has active forums on using the software. Online forums can be the fastest way to get a problem solved if someone else has had it already, and having this one tightly integrated into the software will likely attract more Agenda users and make the discussions more helpful. The icing on top: interaction with Agenda “just works.” Memorized keystrokes from Safari and OmniOutliner increase the font size and indent lists. The right sidebar’s Related and recently edited and related notes act like a browser history with automatic linking. Aside from clicking around in the sidebars, the main way you navigate your data is with a search field at the top of the screen. Speaking of which, experiment with clicking and Control-clicking on everything you see in the interface, since nearly all of it does something, and you’ll undoubtedly discover different and potentially better ways of interacting with Agenda and your data. In the end, if you’re the sort who keeps looking for the perfect note-taking and organization app, and nothing has quite scratched your itch yet, take Agenda for a spin. It’s far from perfect, but many features in it are well thought-out and work well. Despite some software flaws, Momenta gets high marks for responsiveness, and that is on display in the support forums as well. 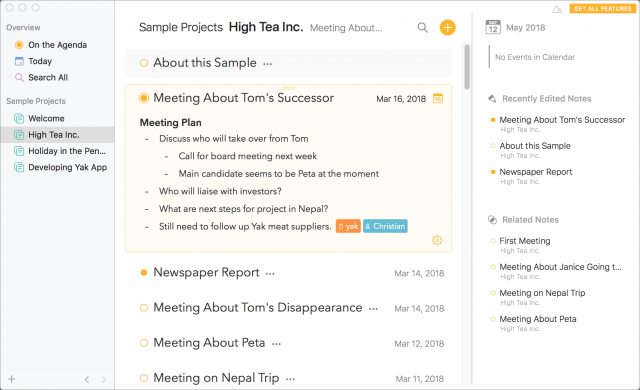 You can get a sense of how well Agenda will work for you as free software quickly enough, and during that time you’ll also undoubtedly determine if you need the $24.99 premium features. That said, those who need an iOS version may wish to wait a bit, since it may be frustrating to become dependent on a note-taking app that you can’t access from your iPhone or iPad when you’re away from your Mac. I’ve been trying it out. I agree with the review - lots of potential, still not quite baked. I’m trying to find a place for it, since it has a fair bit of potential. I tried Noteplan, which was also promising but was too tightly tied to the “one note per day” paradigm. Is anyone else giving this a shot? I’m still using it irregularly, which is not true of all the software I review. Which is to say, I’m not yet in the habit of keeping running notes on everything, but when I do, I’m tending towards using Agenda to do it. That said, what’s annoying about it is really annoying. May very well drop it and make a note to come back in 2019. It looks nice … and has a certain feel to it that I like. But I can’t do islands … have to have iOS or there’s really no point. Thanks very much Jeff for your review - I might never have found out about this app otherwise. Agenda is a really nice looking app with some neat features and I like a lot about it. It does have some limitations but as mentioned in the review and by Frankns it is the lack of an iOS companion which is the biggest barrier to using it more for me. However, there is now an iOS beta which seems to be progressing well - so I’m hopeful that this obstacle will soon be overcome. Thanks for the great review. I created some new content and imported some notes from other apps to test Agenda on my Mac. Not having the content on my iOS devices was a big barrier. Now that iOS apps have been rolled out I’m continuing my tests. The apps have a good look and generally a good feel to them. I haven’t figured everything out and have had formatting problems with some earlier notes. The built in forum helps. So far I’d say Agenda is promising and with more users & input might become a major player in notes/tasks management.